Meenaben used to dread the onset of summer every year. 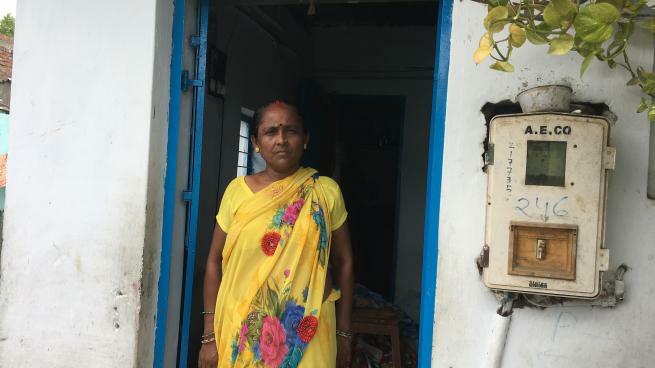 Her small two-room home in a slum in the western Indian city of Ahmedabad would get so hot that she could not sit indoors for several hours in the day, even with a ceiling fan running. Two months ago, however, she agreed to try an experiment: A non-profit organisation that works in the Ramesh Dutt Colony where she lives, on the outskirts of the city, painted her tin roof with white reflective paint, to try to reduce the heat. The simple change worked. Through the month of May - usually the hottest time of year with temperatures reaching nearly 45 degree Celsius (113 degrees Farenheit) on many days - Meenaben, who goes by one name, has been able to sit in her home and even work, sewing quilts and bedcovers. "We used to really suffer from the heat. We could not sit inside, we could not work, people were falling sick," she said. "This year it has been so much better. The paint brought the temperature down by several degrees, and I have been able to sit in my home, do my work," she said. The reflective paint is an experiment by Ahmedabad-based Mahila Housing Trust (MHT), a non-profit that is teaching women to be more resilient in 100 slums in five cities. The organisation, which focuses on upgrading and redeveloping slums and helping women secure property rights, is also helping women deal with climate change pressure, through techniques such as rainwater harvesting and composting. "They work so hard to improve their lives, their homes. But even one setback from something like flash floods or a heatwave can have a big impact and cause them to slip back into poverty," said Bharati Bhonsale, a programme manager at MHT. "A flash flood can destroy their belongings, heat stress affects their work and their health. So it's important they are equipped to manage the effects of climate change," she said. Increasingly extreme heat is one of the many effects of climate change in India, where a modest 0.5 degree Celsius rise in average temperatures over the last 50 years has led to a nearly 150 percent hike in heatwaves that kill at least 100 people. The number of recorded deaths due to heatwaves in 2015 – more than 2,400 – was higher than the death toll from any other natural disaster that year, according to government data. Ahmedabad knows first hand the dangers of extreme heat. A major heatwave in 2010 caused more than 1,000 deaths. In 2013, the city adopted a Heat Action Plan that includes a warning system, and works with civil society groups to try to protect the city's most vulnerable people. MHT knows the disproportionate effect of climate change on the city's poorest residents, and is trying to do something about it. It is experimenting with reflective paint, insulated ceilings and modular roofs in homes in Ramesh Dutt Colony. These are low-cost options that can bring down indoor temperatures by several degrees, Bhonsale told the Thomson Reuters Foundation. Women are also trained in measures such as using fuel-efficient stoves to reduce reliance on firewood, rainwater harvesting, composting, cleaning stormwater drains and planting shrubs to help prevent flash floods. The trust has installed a warning system in some slums that sounds an alarm during heavy rains, so residents can move documents and food to higher spots in case of flooding, Bhonsale said. "For poor women their home is also their workplace, their storehouse. They are much more sensitised to the impact of climate change, and understand the seriousness of it," she said. In Ramesh Dutt Colony, the women have also learned to keep the narrow lanes trash free and look for places where rainwater may collect, to prevent the spread of mosquito-borne diseases such as malaria - another effect of rising temperatures. In teaching women about climate change and its effects, Bhonsale often uses a modified version of the children's board game Snakes and Ladders. Getting a property title or using a solar cooker takes them up a ladder, while losing belongings in a flood or being unable to work because of the heat brings them sliding down on a snake. "They may not understand the science of global warming, but they have first-hand experience of its effects, and with some education and simple solutions, they are better able to tackle it," Bhonsale said. "They no longer have to say: this is how it is, we can do nothing about it." * Reporting by Rina Chandran @rinachandran, Editing by Laurie Goering. Please credit the Thomson Reuters Foundation, the charitable arm of Thomson Reuters, that covers humanitarian news, women's rights, trafficking, property rights, climate change and resilience. Visit news.trust.org to see more stories.